Does a Black Face in a White Place Count as Progress at the University of Ala.? When is progress actual progress and when is it an act of tokenism? That’s the question some have pondered since the election of Jared Hunter as student president at the University of Alabama. 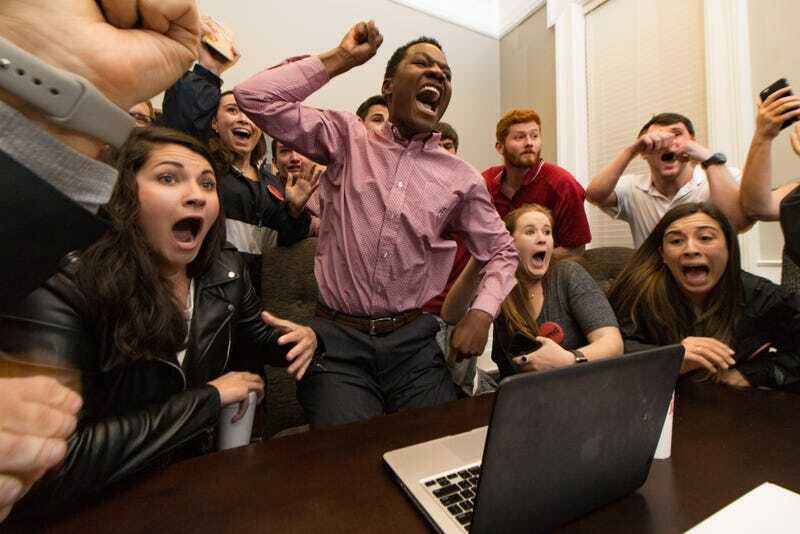 While many praised his victory as a symbol of progress—the 21-year-old junior being only the third black student to win the student government presidency in 54 years since the school began admitting black students—many other students, especially black students, were skeptical. A secret society that has long dominated campus politics and social life, the Machine has an infamous history when it comes to race relations. Officially named Theta Nu Epsilon, the Machine is a 100-year-old secret society made up of a select group of traditionally white fraternities and sororities that has long pulled the strings of campus politics, at times with allegedly coercive tactics. Not only is it a powerful force on the university campus, but it has historically served as a training ground for local and national politicians. Just a few years ago, the elite group was accused of rigging a local school board election to benefit a UA alum. Thus, while the president of UA’s National Pan-Hellenic Council (the governing body of black fraternities and sororities) endorsed Hunter in a campaign video, black Greeks have generally been quiet about his victory. Shelby Norman, a senior and member of the largest black sorority on campus, Alpha Kappa Alpha, said that student elections are just not a priority for Alabama’s black Greek-letter organizations, which are more focused on community involvement off campus. Clearly, though, that wasn’t the only reason she and her friends weren’t out celebrating. Hunter has done little press since his election, and declined my numerous requests for an interview. But he went public about the Machine’s endorsement a week before the election and promised to act independently: “The Machine’s stigma casts a shadow on the history of this university to this day. I wrestled with the dilemma—and eventually realized I had an incredible opportunity. I knew my campaign and my ideas were my own. No matter who chose to support me, I would run on my own terms,” he wrote in the school paper, the Crimson White. That didn’t do much to assuage those skeptical of the hoopla around his win. Within the responses of the many Alabama students with whom I spoke, were the echoes of black Americans’ reactions to political firsts on the national stage: How many times has the election of a black official been heralded as a signal of change—regardless of whether the institution behind the win has shown any intention of tackling the systemic discrimination many African Americans still face? To paraphrase the title of The Root contributor Michael Arceneaux’s essay back in 2014 following the election of Sen. Tim Scott (R-S.C.) and Rep. Mia Love (R-Utah): Black wins may be historic, but they’re not (necessarily) progress. That may not be the case with Hunter. The first African-American member of UA’s chapter of Theta Chi, he carried 54 percent of the vote in the three-candidate race and vowed to foster inclusion and promote transparency in student elections. But in helping elect him, the Machine seems to have continued to employ the tactics that often prevent independent students from succeeding in campus politics by rallying Greek students to support one of their own instead. According to a recent exposé by the Crimson White, the Machine threatens to jeopardize the social life of fraternities, sororities and their members if they don’t follow the secret society’s wishes. And he had a more concrete bone to pick with Hunter’s election: allegations about campaign violations (not infrequently made against the Machine’s candidate), which, in Mosley’s eyes, should have disqualified Hunter. Early this year, the UA’s Elections Board (pdf) found that Hunter’s campaign went over the spending limit and paid a $500 tab for students at a kickoff party. On its website, the board also urged students to come forward and give information about the Machine. The Office of Student Conduct said it is currently investigating Hunter and additional allegations concerning several groups and individuals who may have “tampered or interfered with the SGA election process.” The university’s Elections Board has cited the Machine’s endorsement and Hunter’s failure to complete community service as possible campaign violations, and has urged the Office of Student Conduct to consider all sanctions, including Hunter losing his right to serve. In a Crimson White article, Hunter’s campaign manager, Caitlin Cobb, said that the UA’s Elections Board unfairly targeted her candidate. “The number of emails we received from the Elections Board, some totally frivolous, combined with the many times our team was called to appear before them was unlike any [investigation] the University has seen before,” she wrote. Black students on campus aren’t the only ones wondering how much the election reflects any real change in the Machine’s philosophy. For many students, the election was less about Hunter as a candidate than about the Machine’s effort to keep up with changing social and political dynamics on campus. “The fact that even the Machine has to run an African American for president speaks about the progress the university has made in the last couple of years,” said Josh Shumate, a white student who helps lead a campus watchdog organization that monitors UA elections called the United Alabama Project. As I helped report in Fusion TV’s investigative documentary The Naked Truth: Frat Power, the Machine has a dismal record when it comes to its relations with black Alabama students: from burning crosses, to protesting the election of the first black student government president in the 1970s, to viciously threatening candidates, to fighting student efforts to integrate UA’s Greek system as recently as 2014. The Machine has adapted over the years, especially when its power has been under threat. In 2013, allegations surfaced that traditionally white sororities were blocking black women from joining. Sorority women were first allowed to join the secret society in the 1970s right after they voted against the Machine candidate and helped to elect the first black student government president. In 2016, the group reportedly supported a white sorority woman for executive office, which students say is very rare, after the Machine candidate lost the presidency once again to an independent African-American student. In response to years of allegations about discrimination, since 2013, Alabama has developed an action plan, with the assistance of the U.S. Department of Justice, to increase diversity in traditionally white Greek-letter organizations. By fall of 2016, there were 104 black students in white fraternities and sororities. That’s less than 1 percent of the total membership, but more than 16 times the number of black members five years ago. The change reflects calls for more diversity within the Greek system at other big Greek schools like Vanderbilt (pdf) and Stanford universities. According to University of Connecticut Associate Professor Matthew Hughey, who has studied race relations in America for more than two decades, people of color make up only about 4 percent or 5 percent of Greek organizations’ membership nationwide. Similar prognostics about broader change were made when Michael Steele became the first African-American chairman of the Republican Party in 2009. The discussions around inclusion that Hunter’s election has sparked go beyond race. While Greek students represent less than 40 percent of UA’s undergraduate student body, fraternity and sorority members hold most of the executive and senatorial positions in student government—many thanks to the Machine’s support. “They have an automatic voting bloc that preclude [non-Greek] students from participating,” Jordan LaPorta, news editor of the Crimson White, who says that Greek power also excludes people from student government on the basis of socioeconomic status. There is undeniable power in Hunter’s election, in seeing a black face at the helm of the student body at an institution like Alabama. The Root contributor Andre Perry has written about how having a black president of the United States showed his 5-year-old son that “he, too, could become POTUS.” Sometimes one person can make a big difference. Obama had the most diverse Cabinet in recent history, and issues like criminal-justice reform and racial disparity became central topics for his administration. Connie Fossi is an Emmy-nominated and award-winning investigative producer at Fusion with special skills in politics, criminal justice and immigration.